I am enjoying a long weekend at home – Ascension day is a national holiday and both my employer (IBM) and my customer (ASML) closed their offices on the friday following it. So I decided to experiment a bit with the bread I bake. The usual routine is that I bake three breads (two sourdough and one with commercial yeast) to get us through the week without having to rely on factory bread from the supermarket. 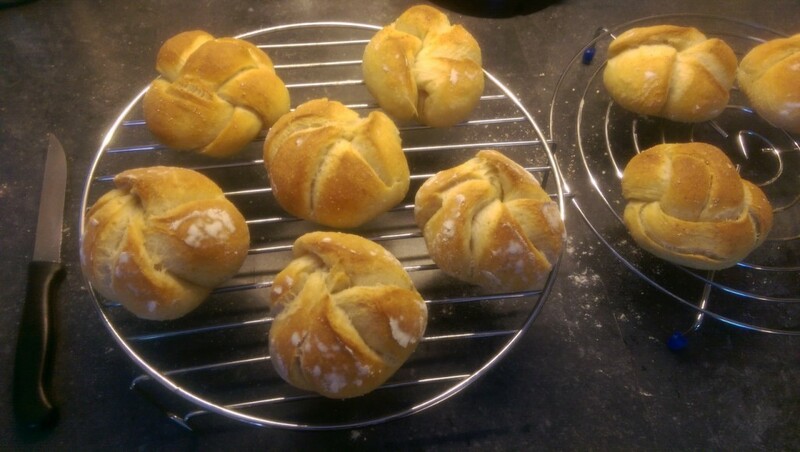 This weekend, I wanted to have a go at Kaiser rolls, also known in Austria as Kaisersemmel or Handsemmel. A piece of traditional artisanal baking skill in Austria, but here you only get the factory made stuff. I wanted to hand-make these traditional rolls according to the old ways. Traditionally, the leaven (natural yeast) would be provided to the baker by the local brewery, but that is not a viable solution nowadays. But we have sourdough, which should have some semblance to the old sour mash from the brewery. So I set out to compare recipes and shaping techniques. There’s lots of recipes to be found actually, and the conclusion with all these white bun recipes is – you just add what you like. In my case, I wanted to go easy on the butter and sugar so that my wife would not have any reservations in sampling the finished product. But afterwards she admitted she would have eaten them whatever the content, they were that tasty. Here is the recipe I ended up with. It was enough to create 11 rolls of roughly 75g each. Knead the dough by hand during 6 minutes until it is silky smooth. Then return the dough ball to a container and cover with clingfilm. Leave the container on the kitchen counter for a bulk fermentation during the night. Do not place the container in the fridge. In 8 hours, the dough will double or almost triple in size. Next morning, dump the dough onto your work area and gently push the air out with your flattened hands. Using a dough cutter divide the mass into pieces of 75 – 80 grams and shape them into balls, creating surface tension. Leave these to rest for 15 minutes. Gently flatten the balls of dough, creating circular disks. Dip them into some rye flour so that they are coated with a thin layer. This will prevent them sticking together. Leave to rest for another 15 minutes. Now, shape the Kaiser rolls. There are several techniques for doing this, but I used what I assume is the traditional way. Here is a nice video of shaping a Kaiser roll. No rubber stamp, no knots in the dough. The real stuff! Place the shaped rolls face-down on an oven tray which has been dusted with rye flour. This is needed so that the folds do not disappear while the dough is proofing. Cover them with a linen cloth or clingfilm. Leave them there for a second proofing, until doubled in size (will take something like 2 hours). Heat up your oven in time, set the temperature to 200C. Place a low metal baking tray on the oven floor. Bake the rolls for 20-25 minutes. Introduce steam during the first 10 minutes by pouring a cup of cold water into the tray on the oven floor and quickly closing the oven door, and vent the oven after 10 minutes. They are ready when the edges are golden brown. When you tap the bottom of a roll with your fingers it should give a “hollow” sound. Leave them to cool for a bit before you cut into them. If you started early in the morning, the rolls will be ready for lunch. There’s no doubt to it: these sourdough rolls are the best I ever tasted. They have a nice crispy crust and the folds opened up nicely while baking. You’ll also note that there is one roll that does not look like a Kaiser roll. I also tried my luck at a braiding a knot and that was easier than shaping a Kaiser roll. I need to practice the shaping process. It was a lot of fun, but 9 rolls does not give you a lot of experience. Definitely something I will do again shortly! Posted: 15 May, 2015 in Me, Recipes. Looks great! I should make bread again–got out of the habit when the old oven was dying. NOw that we’ve got a new one, I should make some. (This one after the one for Goulash). Baking is fun (you are creating something with immediate result), it is rewarding (your family will love you) and relaxing (good old-fashioned handiwork). I take a lot of the satisfaction from figuring out the mix of ingredients and thus determining in advance how a new bread will become. My wife said today, after tasting these rolls, once you get into the habit of eating sourdough bread, the “ordinary” bread actually tastes bland in comparison. You can not achieve the same depth of flavor using commercial yeast, unless you are using pre-ferments or poolish or similar – and then you are basically trying to mimic the characteristics of a sourdough anyway. Huge thumbs up for that article, Eric. I grew up with “Handsemmeln” from my baker in Vienna. This is the food of my youth. Cheers! On a side note, we seem to be very lucky bread-wise in our little South French village. Our baker Ludovic comes from a family of bakers in the Ardèche, his dad was a baker as was his grandfather, he’s turned his passion into his work. Regularly he’s creating new “pains spéciaux”, he only uses organic ingredients, and so we have all sorts of delicious different breads every morning. So we all lack the ambition of even trying to do better than him. This recipe was the best I tried yet for my Kimmelweck rolls! Great for “Beef on weck”!